Ex-Satanist warns Christians don't celebrate Halloween - John15 Rocks! John knows the inner workings of Hallows’ Eve. “I was trained with high-rank devils.” John accepted Jesus as his Lord and Savior and warns everyone to stay away from Halloween. The color orange is associated with fall season when leaves wilt and die while the pumpkin is associated with Ochun goddess. Warlocks around the world celebrate this night by conjuring satanic attack and curses to the community they are assigned to recruit souls, says John Ramirez. Pagan origin: From October 31 to November 2, the Celts celebrated the Vigil of Samhain (pagan lord of the dead). He assembles the souls of those who died the previous year and decided what form it should take the next year. The soul can become human again or condemned to reincarnate into an animal. The evilest souls are assigned to cats. To appease Samhain, they bribe him with gifts and prayers. Samhain also refers to mean the “end of summer” and traditionally has become a way to celebrate “end of harvest”. The pumpkin represents a demon called “Oshun” that controls rivers. It is a type of Jezebel in the Santeria religion. Oshun loves casting romantic spells. To ask her for fertility, offer pumpkin and light candles. Another legend that can be related is the goddess Ochun. She had a Calabaza (pumpkin) who she took care but when it stole money from her husband Orunmila, she sliced Calabaza and the gold coins it stole came out. 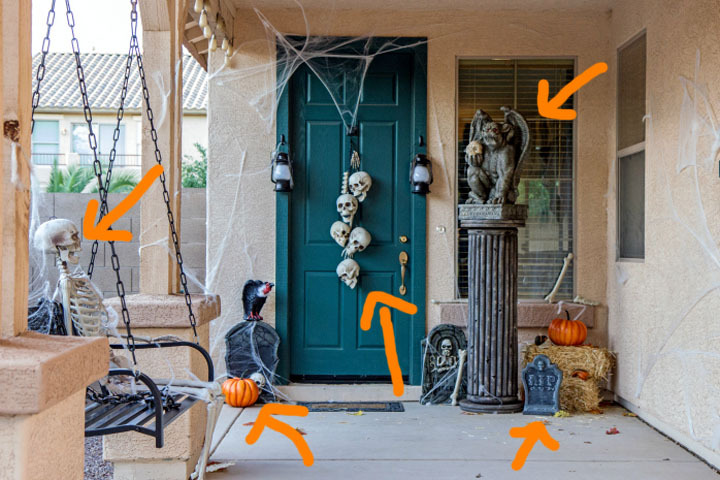 Notice that many people like decorating their entrances with “death,” and they love doing it each year. “Satan loves Christians who celebrate Halloween because it brings a 4 to 5 generation curse into that family,” says John Ramirez. When the door is open, demons can enter and the curse is attached to family members. It’s really sad that many families decorate their homes with pumpkins, skeletons, and devilish elements. It was the end of harvest season that the ancient Celtics celebrated Samhain (origin of Halloween). Harvest season is celebrated even in some churches, and although the vegetable by itself is not demonic, the use of pumpkin symbolizes this pagan tradition. To put it plainly, Halloween is really a Samhain ritual, and Samhain is a harvest festival. When you wear a Halloween costume, you are telling demons that your identity belongs to Samhain, ruler of the dead. Pagans honored the dead and tradition has it that some are resurrected, some are reincarnated. Deception is deep that parents dress their kids like little Zombies. Satanist founder Anton La Vey died few days before Halloween. Remember, you were bought for a price through the blood of Jesus and a Christian’s identity solely belongs to Christ. During Halloween night, Satanists and occultists summons spirit guides to help them hone their magic powers. Others meet in covens and chant curse on people and areas within their territory. John celebrated it with people and demons alike. Many witnesses who claim they saw a glimpse of heaven say that there is no darkness, but only light in heaven. Halloween is all about darkness. Halloween has turned into a children’s celebration. Satan is the father of lies, and he has conveniently made Halloween cute through kids wearing costumes. Rituals are performed that night and those who participate in it become accessories of the devil. 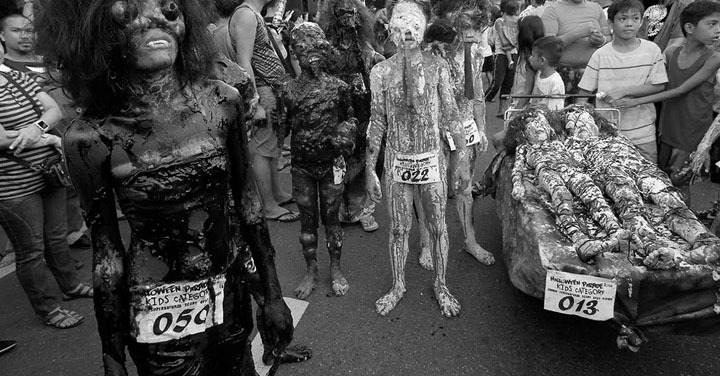 Children dressed in gory blood and death. A Holloween competition in the Philippines. Parents think its fun and unknowingly dedicate their kids to the Celtic god of death. Trick or treat is likened to pagans giving gifts to the lord of the dead, so he will not designate souls to animals such as cats. John said they prayed to Satan and empower their curses or ask favors from the devil. You must renounce these practices through spiritual deliveranceand protect children from being exposed to it. Today, kids are becoming more defiant and arrogant, which is not to say its because of Halloween per se. Case and point, when you allow your children to participate in a demonic ritual, you are opening them to demonic curses as well. → Demonic message of creepypasta – “Suicide Mickey” video. Anton LaVey founded the Church of Satan in 1966. LaVey writes, “the two main Satanic holidays (after one’s birthday), are Walpurgisnacht and Halloween.” Halloween is like a Christmas holiday, where real demons do come out and rejoice with others who participate in Halloween. 1. Declare your faith in Jesus audibly. 2. Declare the authority of Jesus in you, your family, and your home. 3. Declare you are free and cut the cord that connected you to this demonic ritual. 4. Declare that you are cleansed by the blood of Jesus. 5. Declare that you are already forgiven in Christ. 6. Declare that you are free from all forms of condemnation. 7. Warn those who observe the Halloween tradition.